We accept PROFESSIONAL WORKING people as tenants who can provide excellent professional and personal references. Reluctantly, we cannot offer accommodation to either DSS, smokers or people with pets. Prices range from £350 to £500 per calendar month, depending on size and location. 1. WE CHARGE NO LETTING FEES. 2. WE INCLUDE WATER CHARGES IN THE RENT - SAVING YOU UP TO £40 PCM. 3. 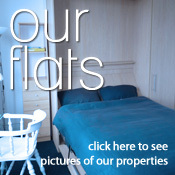 ALL FLATS INCLUDE FREE WI-FI INTERNET. We ask for one month's rent payable in advance. Thereafter, rent is payable by Standing Order only.